Many mysteries abound the land of Greece. A nation of forgotten Gods which whispers the secrets of centuries. Have you ever been intrigued to know what lies in the ruins? Would you like to bask in the Mediterranean sun while you stroll on rustic streets? Greece holds up to all your wishes. You want to walk back on the sands of time then you ought to visit this places. Being the highest mountain in Greece it is a filled with rich biodiversity. Due to deep gorges and tremendous flora and fauna, many tourists take a hike up to Olympus. The foothills or starting point is litochoro. You can wind your way through pimblia and livithra and many small places till you reach the peak. The amazing feeling you will get when you think that this was the very mountain where Gods and Goddesses once lived will be priceless. So come and taste divinity of nature and history.And descent is going to be like from Lord of the rings. Built during the thirteenth century BC this was the home of Oracle of Delphi. She was the priestess of Tholos-temple of Apollo.she sat behind Sybil Stone inhaling ethylene gas foretelling the future in a foreign language. Take a peek into the bygone era. Glimpse the nearby mountains hear the chirping of birds (Delphi is also a sanctuary). Walk around the gymnasium which once held Pythian games – the precursor of modern Olympus. You will never forget to be standing at the center of earth reliving the past in this beautiful ruins. Come!Hail the healing powers of Delphi. 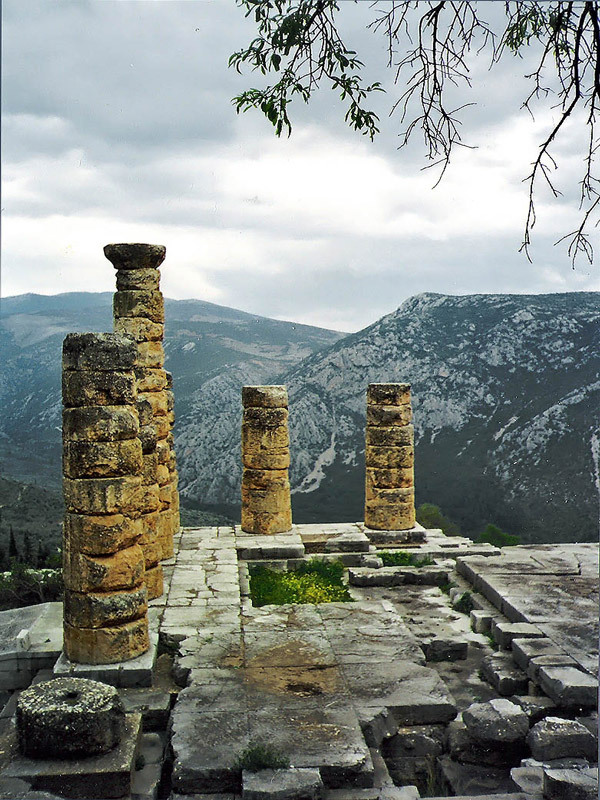 Built during the thirteenth century BC this was the home of Oracle of Delphi. She was the priestess of Tholos-temple of Apollo. She sat behind Sybil Stone inhaling ethylene gas foretelling the future in a foreign language. Take a peek into the bygone era. Glimpse the nearby mountains hear the chirping of birds (Delphi is also a sanctuary). Take a peek into the bygone era. Glimpse the nearby mountains hear the chirping of birds (Delphi is also a sanctuary). Walk around the gymnasium which once held Pythian games – the precursor of modern Olympus. You will never forget to be standing at the center of earth reliving the past in this beautiful ruins. Come! Hail the healing powers of Delphi. Synonymously known as the island of knights after the knight of St John of Jerusalem who conquered Rhodes in the 13th century. You can enter the old town and feel like you are witnessing twenty-four centuries of life here. The intricate fortress-like buildings, narrow alleys, minarets are a tapestry of various cultures. Moving outside comes the new city, which holds a neoclassical touch. The area of Afandu is a good place for lounging at the beach or a heaven for golf players. Rhodes is a perfect balance of cosmopolitan and traditional. So if you want to relax but still you are looking for an action packed holiday come to Rhodes. The temple which is said to have been home to the ancient Greek goddess Athena stands on the glorious peak of city Athens-acropolis. Built in around fifth century BC, this piece of history has been shaken by numerous earthquakes, volcanoes, and storm. Its strength comes from the foundation which is made of limestone. Parthenon was built in such a way that visitors could see the gold and ivory statue of Athena from outside of it. So when you visit it you can feel air from Aegean sea blowing through the columns whispering to you the history of Gods and goddesses who once abided these temple. Did you know that the winds from all four directions of earth blow here… Now that is the belief. The metaphysical powers of Gods will tempt you for experience mystical vibes of Samothrace. It is a treasure house of wild untamed beauty of nature and relics of past. The waterfalls in Samothrace will give you an unadulterated peace. You can hike up on Mount Saos if you are looking for adventure sports. Visit the ancient sanctuary of Gods while you are there admiring the nature. Go have a look at the Nike of Samothrace -the winged victory. There are a whole lot of things you can do here but if you are lazy and just want a sunbath. Go to a beach.